L-R: (back row) Kent Earls, Executive Vice President/General Manager, Universal Music Publishing Group; Mike Dungan, President/CEO, Capitol Records, Nashville; Jody Williams, Vice President of Writer/Publisher Relations Nashville, BMI; and Troy Tomlinson, President/CEO, Sony/ATV Music Publishing Nashville; (front row) co-writer Luke Laird, Eric Church, and co-writer Michael Heeney. 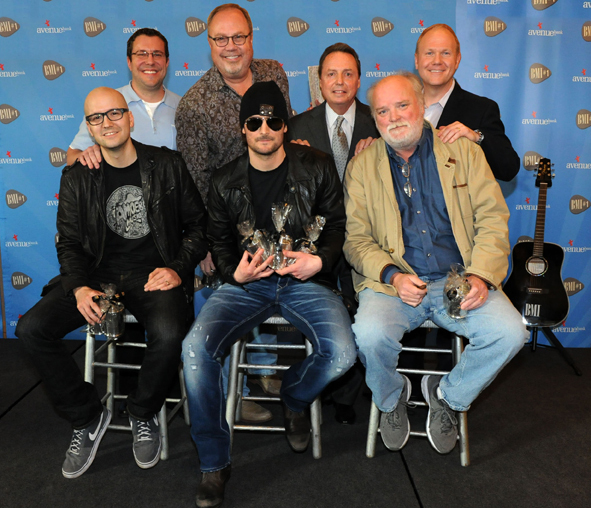 Music industry professionals gathered at BMI’s Nashville office yesterday (Feb. 28) to celebrate Eric Church’s first No. 1 song, “Drink in My Hand.” The rowdy anthem is the second single off of Church’s hit album, Chief. The song was co-written by Luke Laird, who has nine No. 1 hits to his credit, and Church’s long-time collaborator, Michael Heeney, who now has three No. 1s.